Almost every year, my mother corners me to give a dvar Torah at a ladies’ Shalosh Seudos (Seudat Shlishit) our shul organizes at different homes around the community. She always hosts the one closest to her birthday, which happens to fall out this week. This week’s parsha opens the last book of the Torah, Devarim. Devarim means “things” or “words.” It’s a pretty vague name – you might as well have called it “stuff.” But! But. It turns out this book hasn’t always been called Devarim. But why do we need a repetition? Maybe “stuff” isn’t such a bad name for this weird book that – at first glance – doesn’t seem to know what it’s about. Sefer Devarim isn’t about history – the entire book takes place over the last 39 days of Moshe’s life: all one speech, not much story. And it’s not so much about mitzvos either – sure, there are lots of them, big ones, too, but not much we couldn’t find elsewhere. This is old news. Most people say, “well, it’s a new generation, so they need to hear it again.” But why not just read them the original Torah – why write them a whole new one? With this framework in mind, it suddenly becomes clear: sefer Devarim is a treaty between Hashem and the Jewish people. First, this week, we read the preamble, then, the history, conditions; Moshe describes how to preserve the Torah and pass it on to the generations; we hear about the blessings and curses, and finally, he calls on heaven and earth as witnesses, right near the end. And why now? We’ve come a long way with Hashem over 40 years in the desert; big things are ahead with Yehoshua and his conquest of Israel. And now, between the two, just as surely as a ketubah comes between courtship and honeymoon… Devarim comes between our history and our future. But why read it at this time of year? It’s summertime. Many of us – okay, I’ll just speak for me – are at a spiritual low point in our yearly cycle. The material world pulls very strongly in the summertime. Summertime is fun and easy. But along comes the 17th of Tammuz, the three weeks, and finally, the Nine Days leading up to Tisha b’Av. All of a sudden, we’re told to be like mourners: no music, no simchas, no dancing, no haircuts, no meat, no wine. What was that? No meat? No wine?? But actual mourners are allowed to eat meat and drink wine! So why no meat or wine? Because meat and wine are us. In the Bais HaMikdash, meat was everywhere as korbanos: substituting one life for another. Wine, too, was splashed all over the place, like blood. We are meat – fragile human lives. We are wine – easily spilled, bringing out the worst in each other. So for nine days, we leave behind the physicality of summer, our meaty, bloody bodies, and act like the spiritual people we aspire to be. And right in the middle of it, always, we begin sefer Devarim, this “treaty book” that sets in stone our relationship with hakadosh baruch hu. Now, in the ancient world, who were the parties to a treaty? 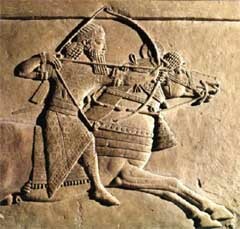 Usually, mighty kings with armies, weapons, fields, animals, resources. Peers, certainly – otherwise, one could just overrun the other. But not here. So we, for our part, abstain from meat and wine, and weep for the days when our love was out in the open; when the whole world could see the sweetness of that connection. This week is also called Shabbos Chazon (“Vision Shabbos”) after the haftarah read the Shabbos before Tisha b’Av, from the book of Yeshayahu (Isaiah). It’s gloomy stuff indeed. Yeshayahu’s whole hideous vision parallels the horrors of megillas Eichah, Lamentations, read on Tisha b’Av. כא הֲשִׁיבֵנוּ ה אֵלֶיךָ ונשוב (וְנָשׁוּבָה), חַדֵּשׁ יָמֵינוּ כְּקֶדֶם. Return us unto you, O Lrd, and we will return; renew our days as of old. ה בַּיּוֹם הַהוּא, יִהְיֶה ה צְבָאוֹת, לַעֲטֶרֶת צְבִי, וְלִצְפִירַת תִּפְאָרָה--לִשְׁאָר, עַמּוֹ. Hashem is “crowned with glory” only when Yaakov “takes root.” His destiny is bound with ours by that sacred treaty, carved in stone, treasured forever. Welcome to sefer Devarim. For many Jews, this prophetic vision of blossoming, of crowning Hashem as king of the whole world, is happening today in the modern State of Israel. The official Prayer for the State of Israel expresses this as terms of “reishit tzmichat ge’ulateinu,” the dawn, or “first growth” of our redemption. I know, I know. I’ve been to Israel and it’s hard to see that vision on the ground, with screaming bus drivers, fistfighting cabbies, mystifying grocery stores. I know our new lives in Israel will be a struggle. These are regular glasses, not rose-coloured ones. Yeshayahu, too, saw clearly. He saw sin; he saw so much badness in Israel… and still, he saw the beauty in our future, and the permanence of that treaty, struck so long ago, between the one God and His beloved nation. And somewhere, between our history and our future, is this dry, dusty, sweet piece of land we call Israel. It’s the greatest story ever told – and I want to be part of it. We are each one small brick in the rebuilding, but every brick counts. May we all merit to be together in Yerushalayim in the restored Bais HaMikdash this Tuesday… and if not, together for a Shabbos meal in the Holy Land someday very soon. On sale now: Poems for all occasions!